Have you been in a marital argument that caused you to destroy things and regret later on?? Well, I have been in that situation many times. I married at the age of 20 years old and I was too immature to handle a marital relationship. But after few years, I have grown out of it until recently but this time I didn’t regret it. 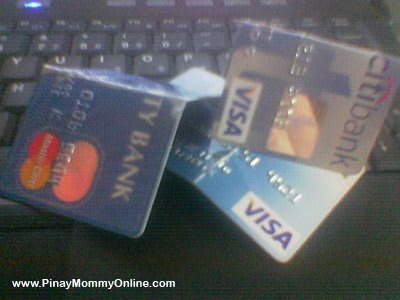 It took my anger to obliterate something that I should have destroyed a long time ago – my credit cards!! Last Sunday, my hubby and I got into our usual “his pride” arguments. I got so hurt by what he said that I literally folded my credit cards (couldn’t tear it up ^_^). I have four but I was able to destroy the other three only because I forgot the forth one in my other bag. Actually, I didn’t regret doing it because I always get tempted to use it and end up having more accumulated debts. I was able to pay off my previous bills but my debts are still mounting up because I still use my cards. Since now they are literally useless, I am glad I did it because if I was not mad, I might have not done it and I would still be in the cycle of compounded (interest) pain. It must have felt good after breaking those credit cards.. hehehe.. Credit cards are really temptation, kaya ako as much as possible I don’t put them in my wallet, to avoid using them. I know it’s not a good thing that you come up with that because of a fight, again with your husband. But the nice thing about it is that you wont be able to use that 3 now. You know, its better to just have one,less temptation. My mom travels but she only have one card, and it still works out good, plus less worries on monthly bills hey unlike when you have four..
anyways, just hopping here.. lol. One is enough Mommy Ruby…like you said it will come in handy in case of emergency…. credit card are also good when you need to establish credit history. i am a blogger now, its hard to get one because bloggers are not bankable here in the Philippines. i have 2 but i don’t use them. i use my husband’s. lol.